MANILA, Philippines — Rain or Shine leading scorer James Yap struggled for only two points but a host of other Elasto Painters stepped up as they stopped the Phoenix Pulse squad on its tracks and seized the lead in the PBA Philippine Cup at the Smart Araneta Coliseum last night. Kris Rosales scored a career-high 16 points, leading those who took charge as the E-Painters beat out the Fuel Masters, 98-94, in an overtime grind to all but clinch a playoff entry in the all-Filipino tourney with a 6-1 win-loss card. Beau Belga produced solid all-around numbers with 16 points, nine rebounds and seven assists while Maverick Ahanmisi, Raymond Almazan and Rey Nambatac hit at least 10 points each as the E-Painters preserved their own hot run while dealing the Fuel Masters a first loss in six outings. There’s Gabe Norwood soaring high to jam in a missed jumper by Belga and a little later knocking in a feed from Ahanmisi as the E-Painters took an 87-82 lead with 56 seconds left in regulation play. 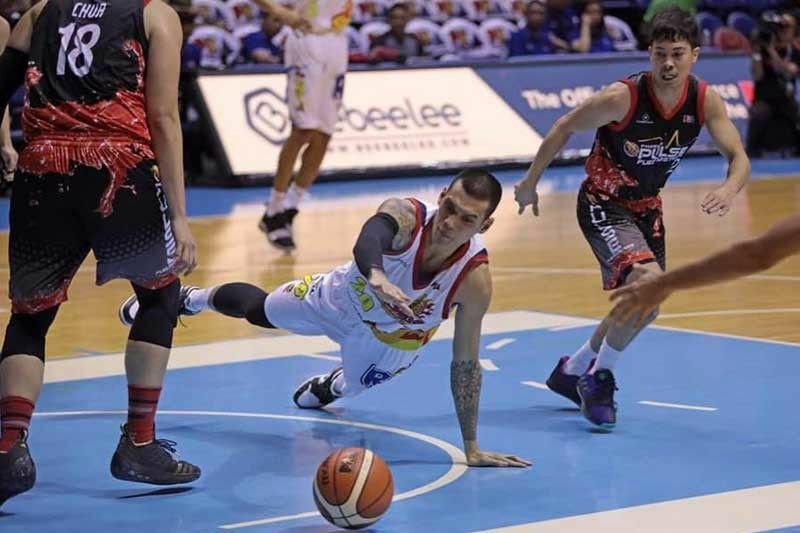 Arwind Santos, June Mar Fajardo and Terrence Romeo all exploded for at least 22 points each as titleholder San Miguel Beer crushed Governors Cup champ Magnolia, 113-92, for its first successive wins in the tourney. “Our last game against Blackwater gave us some momentum going to this game. And the guys were focused, knowing Magnolia is also a champion team,” said San Miguel coach Leo Austria. Rain or Shine 98 – Belga 16, Rosales 16, Ahanmisi 13, Almazan 12, Nambatac 10, Norwood 8, Torres 6, Borboran 5, Maiquez 4, Daquioag 4, Yap 2, Mocon 1, Ponferada 1. Phoenix 94 – Perkins 27, Wright 16, Mallari 12, Jazul 7, Kramer 6, Mendoza 5, Marcelo 3, Napoles 2, Dennison 0, Chua 0, Revilla 0. San Miguel 113 – Santos 29, Romeo 23, Fajardo 22, Cabagnot 11, Lassiter 9, Ross 6, Tubid 3, Pessumal 3, Nabong 3, Mamaril 2, Zamar 2, Lanete 0, De Ocampo 0, Vigil 0. Magnolia 92 – Sangalang 19, Lee 16, Dela Rosa 14, Brondial 12, Jalalon 11, Pascual 8, Simon 4, Calisaan 4, Abundo 2, Gamalinda 2, Barroca 0, Herndon 0, Melton 0, Reavis 0.